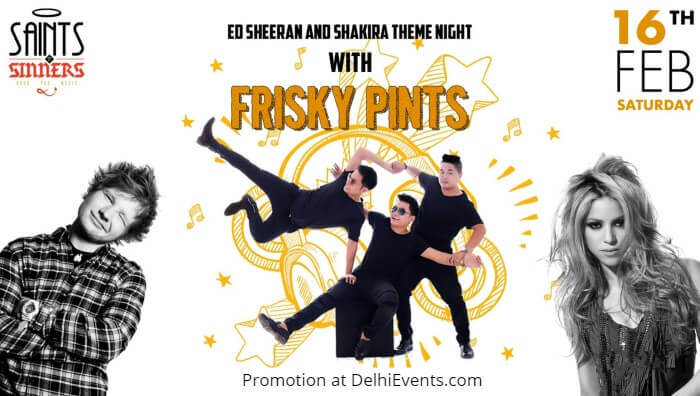 Experience the best of the two musical worlds combined at the Saints N Sinners' Ed Sheeran and Shakira Theme Night with Frisky Pints! Frisky Pints are stirring things up on the 16th of February. Things are about to drum up a notch, better come prepared! The band is one of the first Indian bands to come in the top 25 bands worldwide in the competition hard rock rising which sees global bands competing. The band that has played at festivals and venues across India like ‘Ziro festival of music’, Arunachal Pradesh alongside artists like Lee Ranaldo & the Dust (Sonic Youth, USA), The 7 – Sisters rock festival, Voice of North-East festival, India Bike Week, New Wave Festival Goa, IIT Delhi and more. Experience the magic of the musical performance of Frisky Pints only at the Saints N Sinners!